This rack, as the name suggests, is used for keeping PCR Tubes. Top & base of this rack are made of tough & transparent polycarbonate while the middle portion is made of polypropylene. Particulars: Rack for 96 PCR Tubes of 0.2 ml. 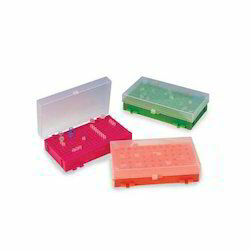 The rack is used for keeping PCR tubes. Top and base of the rack are made of tough & transparent polycarbonate while the middle portion is made of polypropylene. The tube holding spaces are uniformly placed so as to facilitate the use of multipipettes. A no. of racks can be stacked togetherto save shelf. Cat#: 240060. Tarsons PCR Tube Rack. 96 Places. This rack, as the name suggests, is used for keeping PCR Tubes. 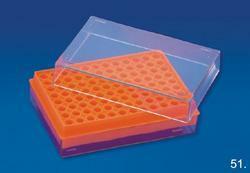 Top & base of this rack are made of tough & transparent polycarbonate while the middle portion is made of polypropylene. The tube holding spaces are uniformly placed so as to facilitate the use of multipipettes. A no. of racks can be stacked together to save shelf space.